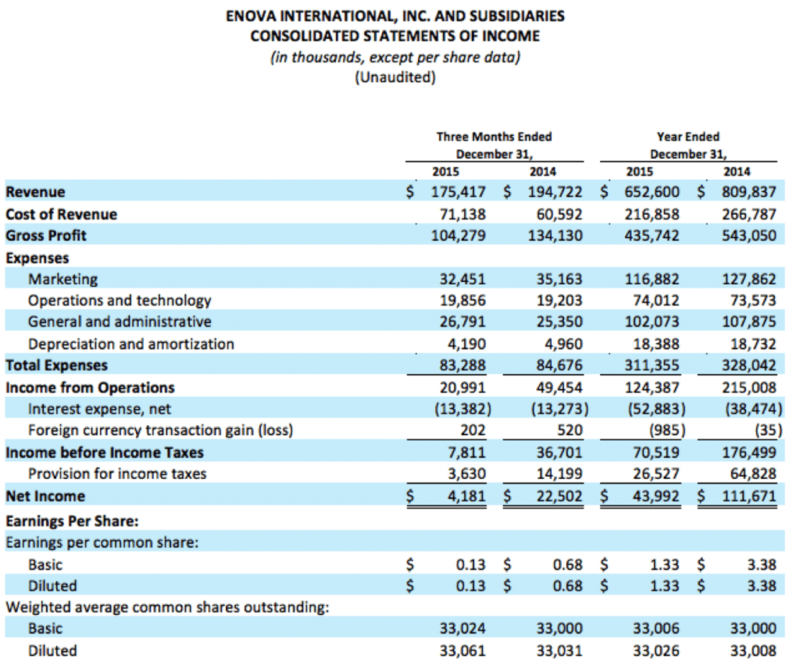 Enova Announces Fourth Quarter and Full Year 2015 Results - Enova International, Inc.
CHICAGO (Feb. 4, 2016) — Enova International (NYSE: ENVA), a technology and analytics driven online lender, today announced financial results for the quarter and year ended December 31, 2015. Total revenue of $175.4 million in the fourth quarter of 2015 declined 9.9% from $194.7 million in the fourth quarter of 2014 as a 10.2% increase in U.S. revenue was offset by a 51.1% decrease in international revenue, primarily due to regulatory changes in the United Kingdom. 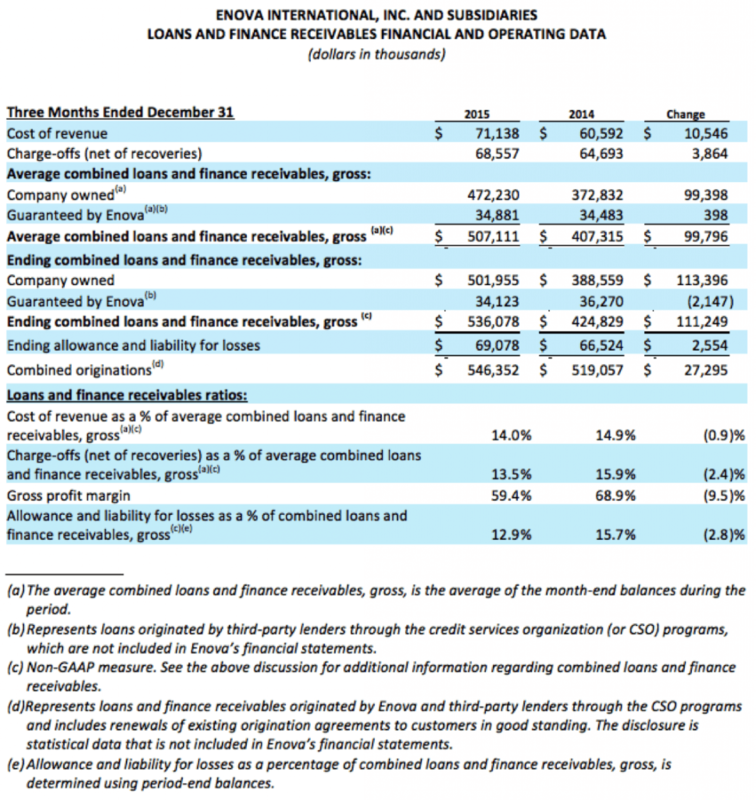 Gross profit margin of 59.4% in the fourth quarter of 2015 declined from 68.9% in the fourth quarter of 2014, driven by stronger growth in the U.S. installment loan portfolio and a higher mix of new customers, which require higher loan loss provisions. The higher gross profit margin in the fourth quarter of 2014 was heavily influenced by the regulatory changes in the United Kingdom and the resulting decline in loan portfolios in that market. 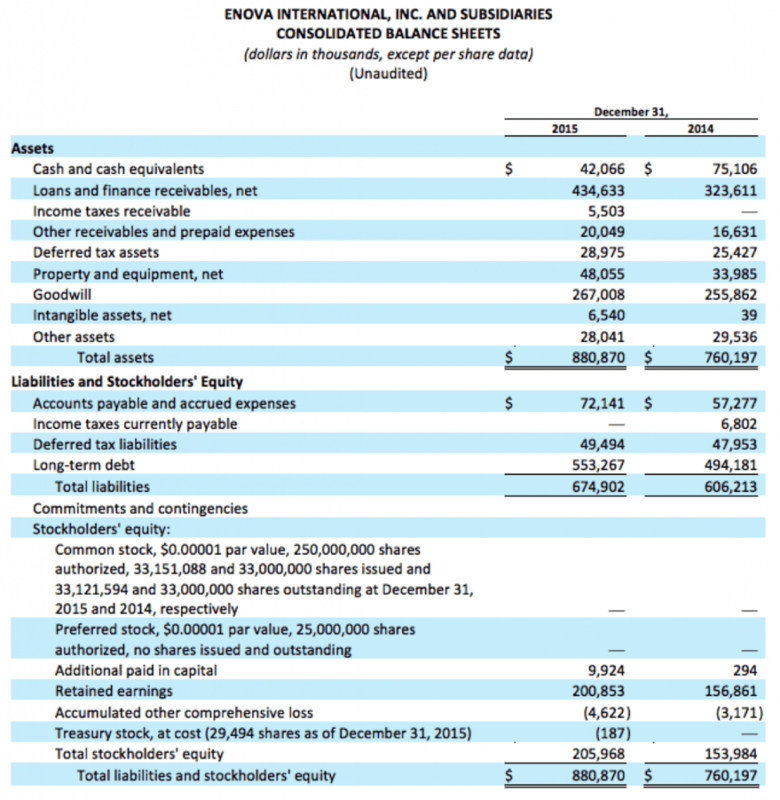 Adjusted EBITDA of $28.3 million, a non-GAAP measure, compared to $54.8 million in the fourth quarter of 2014. Net income decreased to $4.2 million, or $0.13 per diluted share, in the fourth quarter of 2015 from $22.5 million, or $0.68 per diluted share in the fourth quarter of 2014. 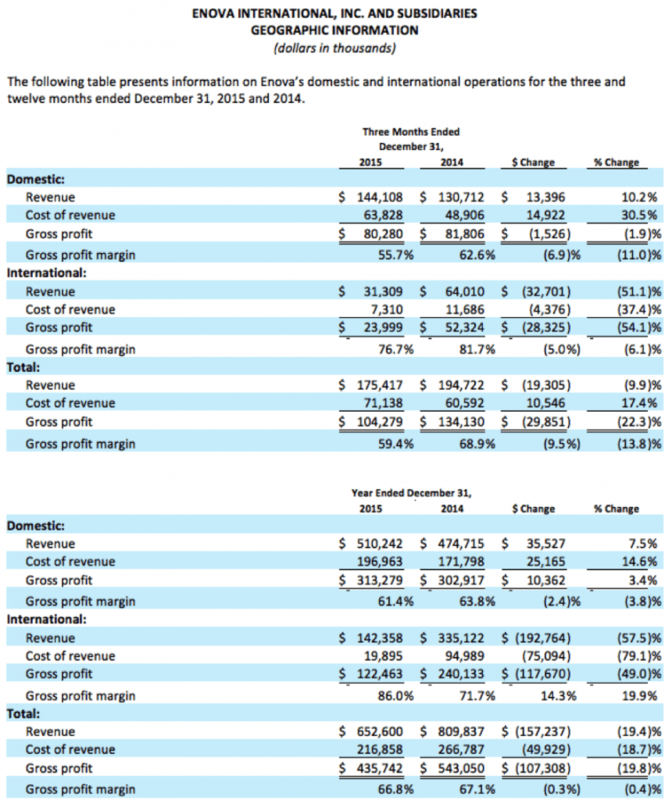 Total revenue of $652.6 million in 2015 decreased from $809.8 million in 2014, as a 7.5% increase in U.S. revenue was offset by a 57.5% decline in international revenue. Gross profit margin of 66.8% in 2015 compared to 67.1% in 2014. Adjusted EBITDA of $155.7 million in 2015 compared to $235.8 million in 2014. Net income of $44.0 million, or $1.33 per diluted share, in 2015 compared to $111.7 million, or $3.38 per diluted share, in 2014. 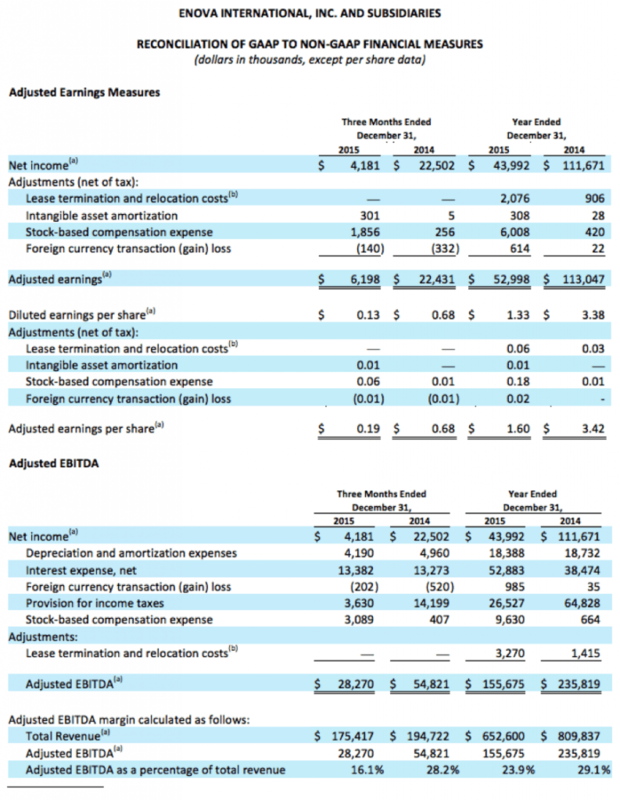 Adjusted earnings, a non-GAAP measure, of $53.0 million, or $1.60 per diluted share, in 2015 compared to $113.0 million, or $3.42 per diluted share, in 2014. “Total originations rose sequentially in each of the last three quarters and we achieved our second consecutive quarter of year over year growth in originations since regulatory changes were implemented in the United Kingdom during 2014. This growth was led by our installment loan products, most notably our U.S. near-prime offering. Overall, installment loan products have grown to represent the largest portion of our revenue mix, accounting for 66% of our loan balances and 45% of total revenue in the fourth quarter,” said Robert Clifton, CFO of Enova. Enova ended the fourth quarter of 2015 with cash and cash equivalents of $42.1 million before issuing a term note for $107.4 million in January 2016, under its $175 million securitization facility. As of December 31, 2015, the company had combined loans and finance receivables of $536.1 million, an increase of 26.2% over the prior year period, and outstanding debt of $553.3 million. 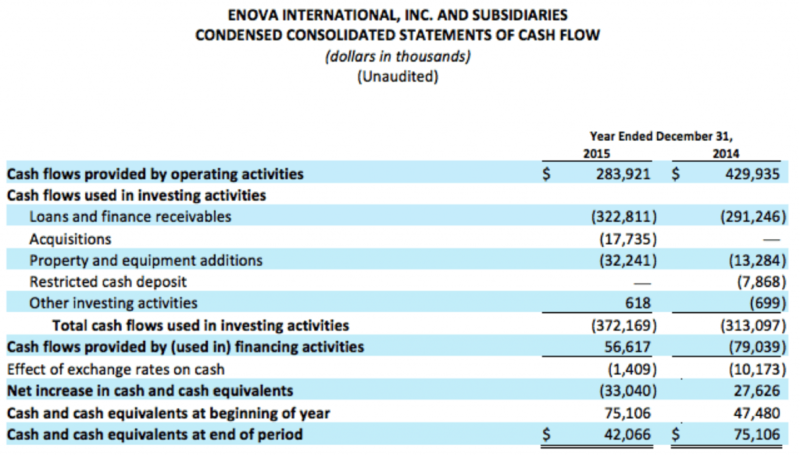 During the fourth quarter, Enova generated $78.4 million of cash flow from operations. 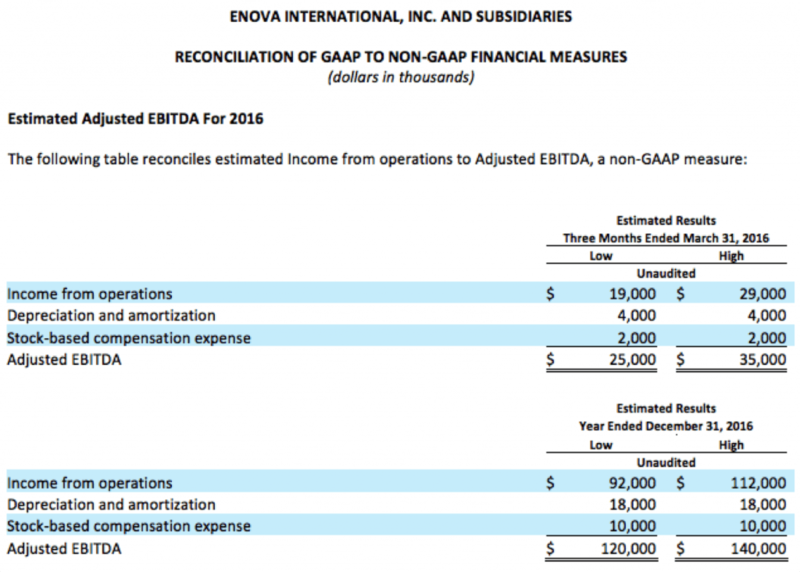 For the first quarter 2016, Enova expects total revenue of $150 million to $165 million and Adjusted EBITDA of $25 million to $35 million. For the full year 2016, Enova expects total revenue of $675 million to $725 million and Adjusted EBITDA of $120 million to $140 million. Enova will host a conference call to discuss its results at 4 p.m. Central Time / 5 p.m. Eastern Time on February 4, 2016. The live webcast of the call can be accessed at the Enova Investor Relations website at http://ir.enova.com, along with the company’s earnings press release and supplemental financial information. The U.S. dial-in for the call is 1-855-560-2575 (1-412-542-4161 for non-U.S. callers). Please ask to be joined to the Enova International Call. A replay of the conference call will be available until February 12, 2016, at 10:59 p.m. Central Time / 11:59 p.m. Eastern Time, while an archived version of the webcast will be available on the Enova Investor Relations website for 90 days. The U.S. dial-in for the conference call replay is 1-877-344-7529 (1-412-317-0088). The replay access code is 10078909.